VIRAMAR offers expansive exterior lounge and dining areas combined with a spacious and comfortable interior. She has a fabulous flybridge offering a 360 degree view of the Caribbean, a forward cockpit for cocktails plus there´s a large aft cockpit for lounging and alfresco dining. There are 4 queen cabins each with a private en-suite bath with electric toilet and stall shower. In addition there is one twin bunk cabin with a private bath, electric head and stall shower. Port aft queen is crew cabin. Send us an inquiry to get specific pricing for Viramar. My husband Rich and I, along with a group of friends, just completed charter with Erika and Tyler. I really want to express to you how much fun we had and what an amazing crew you have hired! While the BVI is beautiful all in itself and your boat is also amazing, I´m 100% confident that our trip was made SO much better by having them guide us and be part of it with us. Tyler was so knowledgeable, Eriks´a cooking is amazing and they really added a fun factor. They both know how to read their guests very quickly, and consequently tailor each persons wants, needs and desires accordingly. That is an invaluable trait that can´t be taught....hold on to these two!! The home that Erika has made on the boat is also beautiful, warm and welcoming from the minute you set foot on it. We had requested 3 different theme nights, and man did they do a good job accommodating those and far exceeding our expectations! I´ve left public reviews everywhere I can, and will be happy to anywhere else you might like me to that I´m unaware of. I´ve also copied our broker on this email, because I want to be sure she knows how happy we were as well. We will definitely be booking again for years to come... probably here again, but we also look forward to the new locations that Viramar is thinking of going..Bahamas and Aruba! We will travel with Tyler and Erika to each new location they may decide to go!! It´s hard not to have an amazing trip when you have all the right elements: amazing views, delicious food, tropical breezes, a simply stunning boat and fun friends. But what makes this trip go from amazing to perfection is Tyler and Erika. They are endearing, charming, knowledgeable and welcoming. We feel like family on Viramar and know we have made life long friends as well as memories. Thank you and can´t wait to come back!! The interaction with Tyler and Erika made the trip. Amazing food, service and guide through the BVIs!! Wow! What an amazing and life changing week this has been! Every minute of every day were fun and magical. The two of you are a dynamic duo and make the trip! Erika, the food was amazing and all your special touches never went unnoticed. Tyler all your stories as we sailed really show your knowledge. Love you guys and can´t wait to return!! What a great week - we certainly conquered the Virgin Islands - sailing almost all of it. Food was delicious and accommodations were great. We enjoyed sailing, swimming, snorkeling, water skiing, wake boarding, tubing, dinghy adventures and even a dolphin sighting. We loved returning to our favorite VI spots and discovering new ones with you. Thank you for making this a fun filled and relaxing trip. Tyler and Erika, Thank you so much for this amazing vacation! You guys really got to know what we wanted to do! From beach bars to quiet coves we loved it all. The food was to die for! And Erika you pulled of our theme nights beautifully! Tyler thank you for the amazing scuba experience and the rest of the fun you provided! ´I leave you for 5 min! !´ [inside joke] Best of wishes to you both in all your future endeavors! What a beautiful and amazing week in BVI. The two of you are truly delightful. We has so much fun...Such a memorable week. Thank you! We had the most wonderful week on Viramar with Erika and Tyler! They are an amazing couple, knowledgeable and fun! We were thankful for Tyler´s scuba expertise and taking us to the best places to scuba and snorkel. He took us to the most beautiful areas to hike and beaches to relax...took the kids tubing and paddle-boarding and Lilly-padding, and cliff jumping! Erika was an amazing chef! Every day new and delicious, imaginative food with local flair. She kept the boat spotless and was there for our every need. They even joined us for some card games and were very personable and fun to be around! They were amazing with our kids!! We loved every minute of our trip! Could not have been better! Viramar is a beautiful, clean, and accommodating vessel! We enjoyed every inch of that boat and our trip. Thank you Erika, Tyler, and Viramar...it was the perfect way to start off our year! We lucked out with the boat...Everything was effectively brand new due to their complete refit last year. The scuba equipment was top notch and literally had never been used. Cabin accommodations and all heads were contemporary, clean, and comfortable. Between the fore-deck, saloon, fly bridge, and “back patio”, there was ample room for 8 guests and all their stuff to spread out. Tyler is a phenomenal and enthusiastic dive instructor/master. We felt very comfortable with his skipper skills. He’s a fun and educational captain, sharing local knowledge, experience, and stories while keeping us safe on and in the water. Erika is a wonderful host. Every meal was perfectly tailored to our group’s tastes. Meals were delicious, healthy, satisfying, and beautifully presented. It’s a testament to her culinary skills that she could convince a 9-year old to devour fish poke or chicken coconut curry like they were lucky charms. She kept the boat spit-spot the entire time—a challenge with 4 adults and 4 kids. She did not skimp on anything and was ever ready to make another Painkiller, refill your water bottle, or pour another glass of wine. In their precious few minutes of downtime, both Erika and Tyler joined in our fun, be it snorkeling, scuba diving, kite boarding, sundowners, or just playing a hand of nertz or bananagrams. 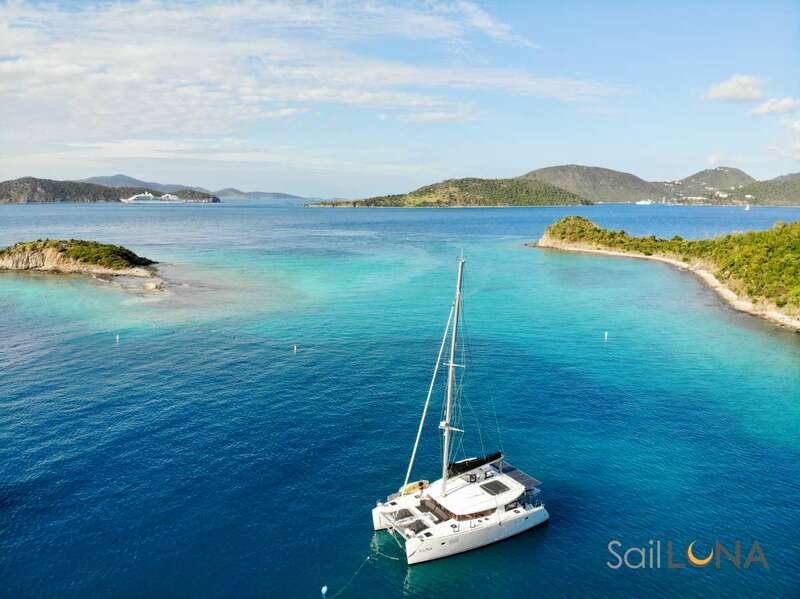 We’ve done a lot of charters in the Caribbean and had been to the BVI on 3 other occasions. This was by far our best experience and would highly recommend Viramar for either novice or experienced sailors. Recommended for: action-sports people, scuba divers, families, young charterers. Highlights: diving the Chikuzen wreck. Jumping off the rock in Virgin Gorda. The last day on Cooper Island Beach Club. Every meal. It´s hard to find words that accurately describe my experience which don´t sound like generic exclamations or empty superlatives. Amazing. Magnificent. Splendid. Awesome. These are all passable and yet, somehow only hint at what I felt during our week-long journey in the BVIs. Tyler and Erika are very special. Both are smart, experienced, funny, skillful, caring, knowledgeable, and charming. Extremely capable apart, yet a fantastic team together. I will forever measure other boat crews against them - my litmus test for how it should be. Erika just knocked it out of the park when it came to food. Not only was her menu selection spot-on with our tastes, her execution was among the very best - especially considering it all came from a tiny kitchen rocking to and fro! She is also a very competent first mate - always at the ready to moor the boat, furl a sail, help a diver out of the water, batten down the hatches, or drop the anchor. This was my first trip to the BVIs. I wasn´t sure what to expect in the aftermath of hurricane Irma but let me be the one to tell you that the spirit of the people that work these waters and live on these islands, is indomitable. It may not be the same as it was a year ago, but those changes did nothing to attenuate our joy of being there. In closing, let me not try to wrest more-nuanced adjectives from the English language and just simply say what really matters. We had so much fun. We were happy. We laughed. We marveled. We dove and ate and sailed and soaked up the sun. And we made new friends. This trip was perfect.-Peter B. Where to begin... This trip with Tyler and Erika was more than I ever could have imagined. The food that Erika whipped up was not only amazing tasting, but healthy (our request) and beautiful! Tyler was always there with an amazing story and a good laugh, in addition to being knowledgeable, a fantastic dive master and an outstanding captain. Throughout the trip we played tons of games they had on board, did 7 dives, learned the basics of sailing, had great shore excursions and had plenty of time to relax and take in the atmosphere. Usually my husband, Peter, and I try to never go to the same place/vacation twice, but we are already talking about how to fit this into our 2019 plans. Tyler and Erika, See you Soon! (and tell the Flamingo Hi for us)´ -Jill B. The absolute highlight of our trip to America - thank you Erika and Tyler for a memorable Caribbean holiday! Erika created the most amazing meals for us - we never went hungry and she was so obliging for the fussy little members of the family - she was creative and never ceased to amaze us with what she was able to produce in the little kitchen! Tyler made an excellent captain, involving the kids in sailing between the islands and being very informative. He found us good snorkeling spots and Thomas and I so enjoyed our dives with him. The kids have confirmed it to be the best part of our holiday and we thank both Erika and Tyler for their patience and time they spent with the kids, the games of Uno, knot tying lessons, etc. It was a REAL holiday and we have returned home with many happy memories. Thank you for everything! -Cathy M.
Dream come true vacation to the BVI and USVI! We sailed with the talented and very knowledgeable Tyler and Erika Boruff! They made our trip just perfect for us! We explored the sea, the land and several unique parts of Norman Island, Virgin Gorda, Jost Van Dyke and St. John. It is tough to capture it all in pictures, but it will be memories that we treasure for a lifetime! Sadly we saw the devestation that the hurricanes brought and are happy that we could support the essential tourism of this area as they rebuild. We will be back!´ -Stephanie Y. Best trip ever...thanks to our Captain Tyler Boruff and Chef Erika Boruff! Literally crying that we had to leave! Fantastic food, tons of fun stops and and managed to get all required dives in for Boe and Nic´s diver certification.´ -Jennifer R.
In all our charters, Tyler was absolutely the best hands down...especially for the divers. He´s a real gem. Erika went beyond perfect! Just an amazing young lady. They were flexible, but we mostly stuck to the itinerary we started with because it was best anyway. First time to paddle board and Tyler was the perfect teacher! Even my 82 year old hubby did it! Yay!! Beyond amazing! Erika bent over backwards to find everything we asked for and more. We´ve sailed half a dozen times, including bareboat, and this was by far the best. -Patty S.